The "Poetry Fence" has just come down. Part of the Newburyport Literary Festival, it was in front of the Newburyport Public Library for two weeks. The project began last fall after I installed my piece at Outdoor Sculpture at Maudslay. I had purchased a large roll of tyvek for the project and had lots left over, including pre-cut pieces just ready to be made into books. 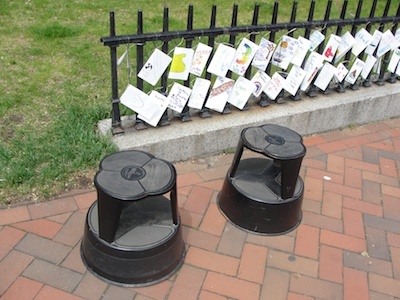 I knew that the Newburyport Literary Festival would be focusing on poetry in 2012 and remembered the PoeTree Project I had done with students when poetry was previously the focus. 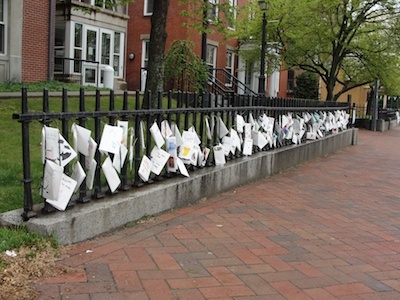 Then, the students wrote poems on strips of tyvek which hung from trees around town. We got permission from the library to use the fence and then I contacted Pat Levitt, one of the fourth grade teachers at the Molin Upper Elementary School in Newburyport. I knew that the fourth grades spent a lot of time on poetry throughout the year as I had made books with them a few years ago. They were interested and it all began. I visited the Molin in late March and spent three hours working with the 8 fourth grade classes in four groups of two with the help of Nancy Smith, a fellow Festival volunteer. We made a practice Hot Dog Booklet from recycled paper that they could use for a draft copy and then a larger one from tyvek to withstand the outdoors. We spent a few minutes talking about the books. I suggested that each book should contain one poem and some simple illustrations. Waterproof Sharpie markers were left for the students to use to write and draw in their books. Two and a half weeks later, a bag of colorful books arrived at my door. More Festival volunteers (Nancy again and Lucia Greene and Linda Harding) joined me for a morning of attaching a string to each book for hanging on the fence. Lucia and I then spent a morning installing the books. With Lucia on her knees on the ground and me in a crouch, it was beginning to get painful. Luckily I got the idea to borrow a few library stools—what a relief! The poems were well-received. I got reports of young and old reading the poems and many positive comments about the quality of the poetry and the presentation. Thanks to all who made it happen. And to Alyson Aiello who interviewed me for a blog post about Poetry, Art and Children at Newburyport Today.